Kulangad is considered to be one of the three toughest treks in Sahyadri’s with the other two being Alang and Madan Gad and the three are jointly called the AMK. 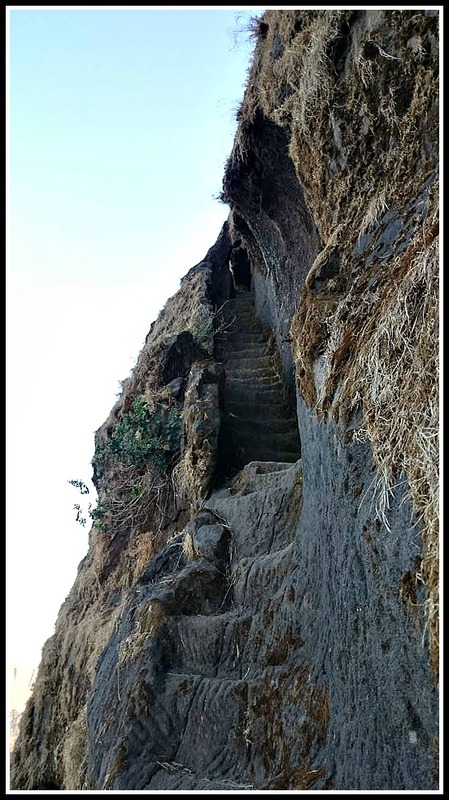 But of the three Kulangad is the only non-technical climb which does not necessarily need any rope, climbing equipment’s or training but nevertheless not for the faint hearted. It is hard to figure out the way, as much of the route is on sheer cliffs and seems like it is heading nowhere to the uninitiated. It is advisable to get a local guide’s help for navigation. Kulangad trek base starts somewhere between the two villages, Ambevady and Kuranguvady. If you are on your own vehicle, it is best to park the vehicle by the side of the road and pick up the trail that leads to the mountains. If you plan to use public transportation, you can reach till Igatpuri by Train or Goti by bus and take a private transportation to the base. It is a two day trek best done during the cold and dry winter season. Little tree cover and arduous rock climbing,slippery slopes makes it unsuitable at other times of the year. The steep climbs in the route start pretty early. We found ourselves in one of the lesser used routes and went along a dried waterfall soon after we moved away from the village farms. After climbing many levels of rocks, with easy and enjoyable rock climbing, preparing us for the trek ahead and ably guided by a set of trekkers who were descending, we somehow got to on the main route which led to Kulangad. This was marked by an arrow on the rock and we felt confident we were on the right trek route. This was followed by a brief period of flat walking, predominantly under the shade. The only major challenge during this period was a nearly 45 degree slope on the mud with little grip on either sides for climbing. We slipped some, grabbed on to some roots and branches and managed to climb the small but extremely steep climb. The trek route continues to ascend slowly and steadily, narrow routes that would not allow a group to rest under shade, but thankfully with little ambiguity on the routes as well. Once we got out of the shadow of the forest, the approach and entrance was visible, but alas still several 1000 ft away, which also means that this last stretch we would be climbing up a sheer cliff with little to fall back on. Since this side of the ridge was to the east and it was well past noon, we did not have to face the harsh sun or resultant dehydration. Thankfully, there was not much of wind too; leaving us only the rock faces to worry about. But yes, that was enough to worry about without the ancillary conditions. There was one big rock to climb, and several smaller ones, with a number of cut steps, leaving me wondering about the sheer labor that would have been required to cut those steps in the rock at such arduous rock faces. There was nothing to grip on the side except at the very end near the entrance on top. There was also a ridge to cross that takes you to more steps on the rock face, the slightly safer ones. We did not have the habit of looking down while climbing. But the brief glance at times, I could imagine the plight of any one with such a habit, might have been petrified at the very glance of these rocky edges that extend into nothingness. The trek route also often seemed to end into oblivion, but on closer look managed to lead us along. After a truly uphill battle on the rockies for an hour, we reached the top of the mountain in time to watch a beautiful sun set. The monkeys sat around watching the same, and left us alone soon after that. But many trekkers have often reported monkeys to be a big nuisance snatching away their food packets. Our only visitor was a little rodent, too small and quick to intimidate us. As a bonus, we saw the moon rise from Horizon on the other side, as soon as the sun went down. Thee moon was so bright, that we did not need our torches outside the cave. There is a big cave on the top which can accommodate more than 10 people, but that day we had the whole cave to ourselves. The cave was also reasonably warm as compared to the outside temperature. The place offered a great view of Bhandardhara Dam and lake on one side and Ghatghar dam on the other side, each competing with one another for our attention. There was plenty of fresh water available on stone tanks above allowing us to refill our bottles for the night and the next day trek downward. We star gazed and moon gazed at night, until it was too cold to hang around outside. The tiredness of the trek gave us both great sleep through the night that we almost missed sun rise. The trek down was quicker than originally expected for the most part, and we slided through the areas, we had difficulty climbing earlier on our way up. We did lose our way a bit and were fortunate enough to be guided by the locals atleast twice to find our way back down. 1) Ensure sufficient quantity of food, warm clothes, sleeping bags/ blankets, torches preferably head torches, tissue including wet tissues, loads of water in your packing list. Temperatures often dip below 10 degree celcius and I found my thermal extremely useful at the peak. 2) Bhandardhara lake which can be viewed from the top is only about 32 Km away and can be clubbed with trip if you have time. 4) Sun Rise and Sun Set can be seen from the top. So plan you trek timings accordingly. If you are lucky like us, you might get to see moon rise too. 5) If you are interested in star gazing, do download the Google Sky app. There are no mobile signals available on the top. 1) Hire a guide or local to show you the way. They would also help you collect and carry fire woods. Carry some fuel for instigating the fire. 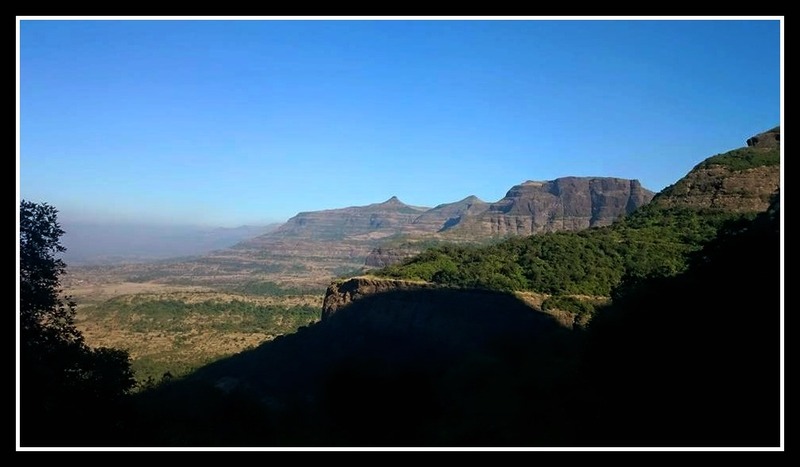 2) It’s a bit risky and a slightly technical trek, unlike many of the Sahyadri treks. Be mentally prepared. 3) Although it takes only about 3 hours one way, do not try to squeeze this it into a one day trek. The way is difficult to find even in the day time and its best to respect the physical limitations of the body and the group.